New ListingAPPLE Watch Series 3 iWatch 42mm GPS Only Space Grey ALUMINUM Works great! APPLE Watch Series 3 iWatch 42mm GPS Only Space Grey ALUMINUM Works great!. Condition is Used. Shipped with USPS Priority Mail. iwatch series 3 space grey 42 mm, gps and cellular. New never used. iwatch series 3 space grey 42 mm, gps and cellular. New never used. . Condition is New. Shipped with USPS Priority Mail. Apple iWatch Series 3 42mm Nike Black. Lightly used only and in protective case the entire time (included for free). Comes with original box and charger. iwatch 42mm series 3 cellular. Condition is Used. Shipped with USPS First Class Package. Broken screen NO ICLOUD locked!! NO RESERVE U COULD GET IT FOR CHEAP!! apple watch series 3 38mm rose gold gps. Shipped with USPS Priority Mail. ICLOUD IS UNLOCKED. Used for few hours and didnt like the size. Almost brand new! 10/10. WILL INCLUDE COMFY BLACK GOLD BAND & Black rubber band as well. Thanks for looking! 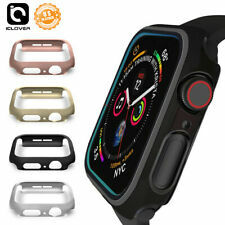 U S O N L Y. N O R E T U R N S. S o l d A S I S.
IWATCH SERIES 3 38 MM ALUMINUM CASE PLEASE READ DESCRIPTION!!!! Apple Watch Series 2 42mm Aluminum Case with Sport Band Gold iwatch Series 2 Kit. Condition is Used. Shipped with USPS Priority Mail. Apple Watch Series 1 38mm Aluminum Case Black Sport Band """IWATCH & BAND ONLY""
Apple Watch Series 1 38mm Aluminum Case Black Sport Band """IWATCH & BAND ONLY"". Condition is Used. Shipped with USPS Priority Mail. 4.5 out of 5 stars - Apple Watch Series 1 38mm Aluminum Case Black Sport Band """IWATCH & BAND ONLY""
563 product ratings563 product ratings - Apple Watch Series 1 38mm Aluminum Case Black Sport Band """IWATCH & BAND ONLY""
Apple watch Sport Series 42mm Space Gray Aluminum Case with multipule bands and original apple white band. Original Apple box and paperwork included. Watch is in used but good Condition. Please see all photos for detail. It works perfectly and looks good. Everything in photos is included. Happy Bidding!! iwatch series 4. Condition is New. Shipped with USPS First Class Package. Condition is Used. IWatch in ABOSULTE perfect shape ! not one scratch ! perfect state ! Haven't been used a lot, I have a large collection of watches. I can include a couple bands as well. Used Apple iWatch Sport 7000 series aluminum 1st generation. Works fine. White band could be cleaned. You are bidding on a New Apple iWatch Series 3 42mm Silver Aluminum w/ Black Sport Band (GPS). This was given as a gift to someone else who didn't want it. It has never been used. Note: If you noticed my last sale was for a iWatch with a White Sport Band. Note 2: Second time on Ebay. First buyer changed his mind. This was purchased from Costco so that is why the box is not shrink wrapped. It wasn't returned because the person didn't want to hurt the feelings of the person who purchased it by asking for the receipt. But as you can see from the pictures, it still has the covering over the face of the watch. If you have any questions, feel free to contact me. Used in mint condition, no scratches. I'm including for free a docking /charging station. Series 2 42mm Aluminum Space gray. New Apple Watch only. APPLE IWATCH SERIES 1 PRE-OWNED IN EXCELLENT CONDITION. This was my personal smartwatch and was only used for a few months. Works perfectly. Does have a very small scuff mark on the back of the watch. The face of the watch is flawless. Has been reset to factory settings. Nike iWatch Series 2 - 38mm Silver Aluminum - Excellent Condition! Condition is Used. I received this watch as a gift, and wore it for about a month. I recently bought a newer mode, so I no longer have a use for this one - nothing is wrong with it. No scratches that I can see, looks like new. NEW: Premium soft silicone sporty look for Watch Series 1 Series 2 Series 3 Series 4. Apple Watch Series 1 Stainless Steel iWatch 38mm US. Condition is Pre-owned. Used less than a week, no scratches ,almost new in excellent conditions . Used Apple Watch Series 3 42MM Sport Band. GPS CELLULAR iWatch. Condition is Used. Shipped with USPS Priority Mail. Iwatch 3 series 42mm GPS Cellular normal wear. Fully functionality. See pictures for better details. IWatch 3 38mm. Minor wear and scratches on back. SEE PICTURES. 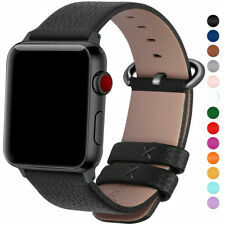 Apple iWatch Series 3 (Rose Gold) Aluminum 42MM Blk Sport Band. I only used the watch for a couple of weeks. This is a 38 mm iWatch sport with pink band. I have original box and all accessories. Factory reset, works great!!! No scratches or wear on the face of the watch. The pink fabric band is slightly dirty, I switched between a couple bands, so the pink did not get daily wear, probably washable. The receipt from Best Buy is pictures with the serial number so you can see it’s age and model, only selling cause I upgraded to the 4. 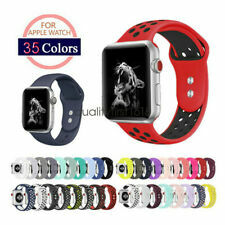 • Apple iWatch Series 3 with Cellular connectivity. This Apple Watch Series 3 is in excellent condition. This is with the stainless steel body. NOT Aluminum. (I believe aluminum to be unhealthy to the body). IWatch series 1 42mm black. Black stainlessteel band. watch is like new (box open but not used). 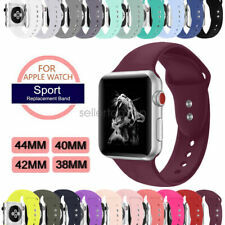 Apple Watch Series 1 - 38mm - Sport Band - Aluminum Case - original band white. New ListingAPPLE iWatch Series 2 Original 42 standard steel Black/Silver Brand new! Apple iWatch Sport 1st Gen 42 mm Space Gray Aluminum. Condition is Used. Shipped with USPS First Class Package. AWESOME Apple iWatch NIKE Series 3 42 MM GPS LTE Cellular Watch!